Feeling your best self is the product of all the little things you do each day to take care of yourself - both inside and out... and that could include a multitude of things, both big and small! Maybe it's your morning coffee that gets you energized and ready for the day, or maybe it's reading those cheesy, positive quotes you save in a Pinterest board (don't we all have one of those?) or wearing those shoes that make you feel just a little more on top of the world. Confidence boosters - we've all got our own favorites! But outside of the cosmetic and glamourous realms of them, another thing that makes me feel like the best version of myself is working out. And I know. Some days it's the last thing you and I both feel like doing, but once you get up and push through it, even on the lazier days, you somehow always wind up happy that you did. I never had the best relationship with working out, and I've talked about my struggle before in a blog post that you can read here. But in short, for a while, I was stuck in a rut and only in it for reasons related to vanity. It became something I dreaded because I associated it with the number on the scale, calories burned, and inches lost. In short, it became an unhealthy numbers game. But years later, I began shifting my focus and though it took time, I eventually found joy in working out. I began focusing not on the number on the scale, but rather how I felt. I discovered things I liked doing like pilates and strength because they challenged me, made me feel stronger both physically and mentally, and made realize what my body is capable of beyond those numbers I dwelled on for all that time. They represent all walks of life and emphasize that fitness isn't a size, a shape, or numbers game. It's not about comparisons. It's not about being perfect, the best, or the fastest. It's simply the notion of being the best and strongest version of you and only you! Another thing I find unique and a cool way to embody their message is their symbol which is the squat. It serves as an empowering analogy that symbolizes how we are able to stand back up whenever life throws us a challenge or difficulty, and to continue getting back up to be our best selves despite whatever it may be that gets us down. And let's be real, workout clothes can be a total confidence booster as well. Feel good, look good, perform well! The store has a ton of colors of tanks and tees all adorned with a wide range of fun, empowering slogans and also their logo. 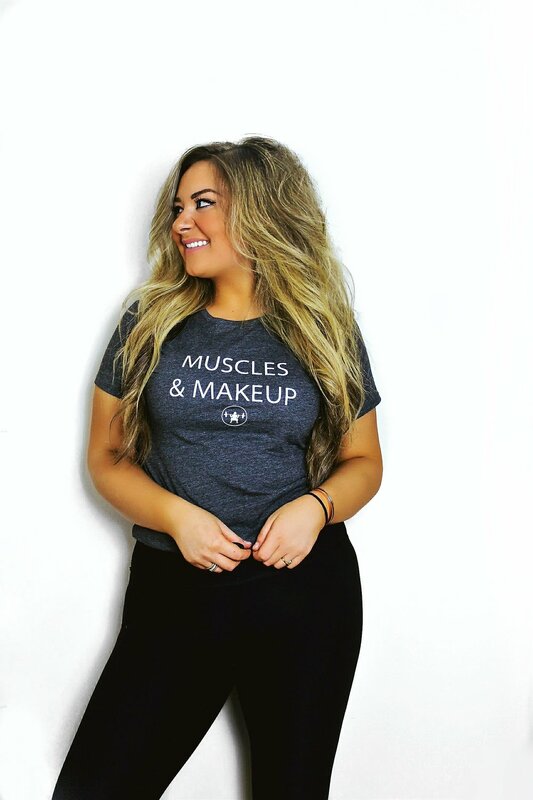 But when I saw this "Muscles & Makeup" tee, I knew I had to have it. I love the fit and the saying so much that I've been wearing it out lately layered a jackets with a pair of boots... yay for versatility! And for that reason, I'm excited to be able to bring you a discount so that you can look and feel your best while representing this philosophy of empowerment and motivation at the same time! At checkout you can use code HSWASKO10 for 10% off your purchase! So no matter where you're at in life, or what challenges you've faced when it comes to fitness, Just Strong's message is such a good one to keep in mind on the lazy days or on ones you may feel discouraged because we all have them, no doubt! Just remember that you're capable of amazing things in this life and to be grateful for your health, strength and all that it allows you to do! Because you're worth feeling the best and strongest version of you, and only you; don't let any game of numbers or comparisons stop you from doing so!